This gluten-free, vegan, and paleo pie makes the perfect holiday dish! The crust is crispy and flaky, the pie filling is deliciously seasoned and it’s simple to pull together the night before any exciting gathering! Add almond flour, arrowroot, and salt to a medium sized bowl and whisk to combine. With a rubber spatula or spoon, stir in the coconut oil and syrup until the mixture is crumbly but sticks together when pressed. Add a little water if the mixture is still too dry, but 1 tbsp should be enough. Form a ball with the dough. 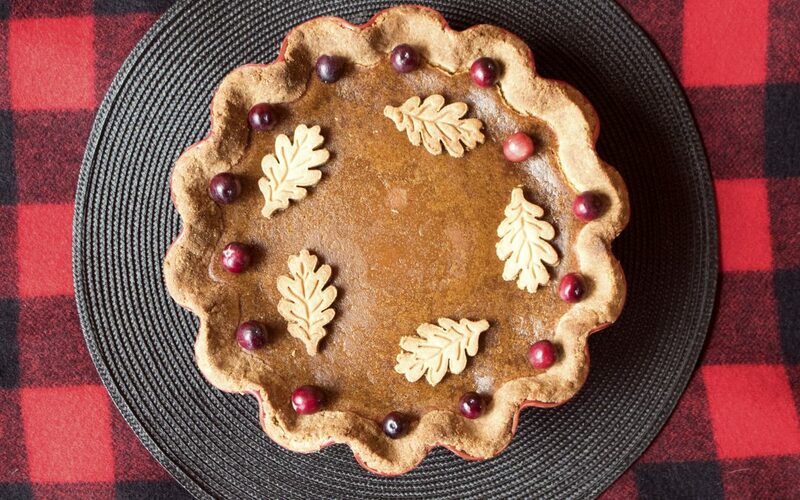 Press into a tart or pie dish, and prick the bottom and sides of the pie crust with a fork to prevent bubbling. Place the crust in the freezer for 5 minutes. Pre-bake for about 10 minutes to prevent it from getting soggy. In a medium sized mixing bowl, whisk together the pumpkin, coconut milk, syrup, brown sugar, pumpkin pie spice, corn starch, salt, and vanilla until very smooth. Pour into the pre-baked pie crust and carefully transfer to the oven. Bake for 35 - 45 minutes, until the pumpkin pie filling has set. Be sure to check halfway through baking and cover the crust edges with foil or a crust shield if they are getting dark. Remove from the oven and let the pie cool completely. Transfer to the refrigerator to set up overnight. Serve chilled with dairy free whipped cream. Hi Marjorie, We are so glad to hear that our recipes are useful. We hope you enjoy! Happy Baking! Am I reading this correctly? 1 to 1.5 cans of pumpkin? Which is it? Please post a more accurate recipe!! Hi Karen, we apologize for the confusion. It’s 1.5 cans or 1 can plus 3/4 cup of pumpkin. We hope that you enjoy! Since I have your product in a box not a can could you just post the quantity you are using rather than say a can? It’s confusing and the quantity is what I need to know. Hi Maya, Thank you so much for bringing this to our attention! We will absolutely fix the recipe so that you can see the quantity in baking terms. Hi Juju! Oh we’re so glad you’re excited about our vegan pie recipe! We haven’t personally tried that substitution, however I think it would work well! In general, you can exchange arrowroot powder and cornstarch at an equal measurement. Please let us know how it turns out, and happy baking!